As regulars might know, I have a weakness for cell phone pictures. I love the way the colors get tweaked. 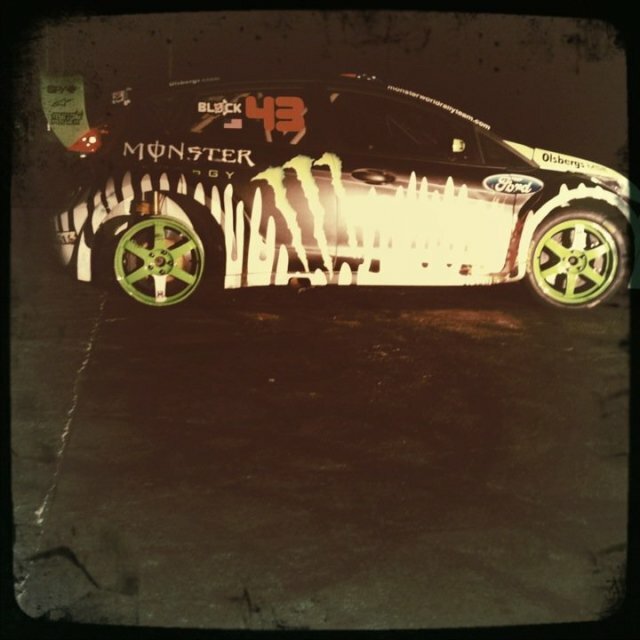 The three images above are made by Matt Martelli (Mad Media) and are behind the scene shots of Ken Block's Gymkhana THREE Part 2 and Ford's NASCAR Adventure with Ken Block and Richard Petty. Oh, I forget to say: Matt is one of the brilliant masterminds behind the Gymkhana series. Thanks for the shots, Matt! Ken Block just did it again. This time he visited France to kill some tires. "Shot just south of Paris, France in Linas at L’Autodrome de Linas–Montlhéry, this 1.58 mile oval track, built in 1924, features banks as steep as 51 degrees, which is more than double the standard incline of most NASCAR ovals. Chosen by Ken Block for this specific reason, the ramp-like banking proved to be a unique and exciting challenge. The driving physics for the stunts performed were totally unknown until Ken Block attempted the maneuvers during filming." Stunning work. Thanks for the tip, Klaus!